What M&O strategies supported by ITS may be available to help achieve our operations objectives? What data is available in our region to monitor transportation system performance and track progress toward operations objectives? How can we most effectively integrate a new M&O strategy supported by ITS with other existing or planned technology deployments to provide a greater level of service for the customer? Effectively integrating management and operations (M&O) into the metropolitan and statewide transportation planning processes requires significant inter-agency collaboration and a regional view of the area's multimodal transportation system. Because many M&O strategies are underpinned by intelligent transportation systems (ITS), the coordination of planning for ITS among agencies at the institutional and technical level is an essential element to planning for operations. The regional ITS architecture, with a focus on integrating transportation services supported by ITS, presents a significant opportunity to support the needs for effective planning for operations. This primer offers transportation planners and operations managers a menu of opportunities for applying the regional ITS architecture to enhance planning for operations. It provides specific entry points for leveraging the regional ITS architecture in integrating operations into the planning process. This primer focuses on the use of an "objectives-driven, performance-based" approach to planning for operations; an approach that increases the potential support from the regional ITS architecture given the approach's emphasis on data and performance measures. Additionally, the primer leads planners and operators through techniques to make a regional ITS architecture relevant and easy-to-use in planning for operations. Why leverage the regional ITS architecture for planning for operations? Integrate and coordinate the technology underlying operations services: Planning for operations without the support of a regional ITS architecture risks poor integration of ITS across the region. The regional ITS architecture facilitates the integration and coordination of compatible ITS across a region so that related projects are implemented more efficiently and travelers experience seamless transportation services as they travel across multiple jurisdictions. Align efforts to make greater progress in ITS and operations: By aligning the regional ITS architecture with the operations goals, operations objectives, and management and operations strategies in the metropolitan or statewide transportation plan, planning for operations and the regional ITS architecture can reinforce each other and make greater strides together toward improving safety, efficiency, and reliability. Use existing resources smartly: A regional ITS architecture that does not support metropolitan or statewide planning, programming, and implementation of operations programs and projects has an extremely limited impact after the initial collaborative benefits of regional ITS architecture development fade. This represents a significant opportunity loss. Connecting the architecture to planning reduces the duplication of effort that goes into both developing the regional ITS architecture and planning for operations. This primer shows the parallels between the processes and how to take advantage of them. This is particularly important for smaller and less complex regions and regions with scarce resources. How does the regional ITS architecture support planning for operations? 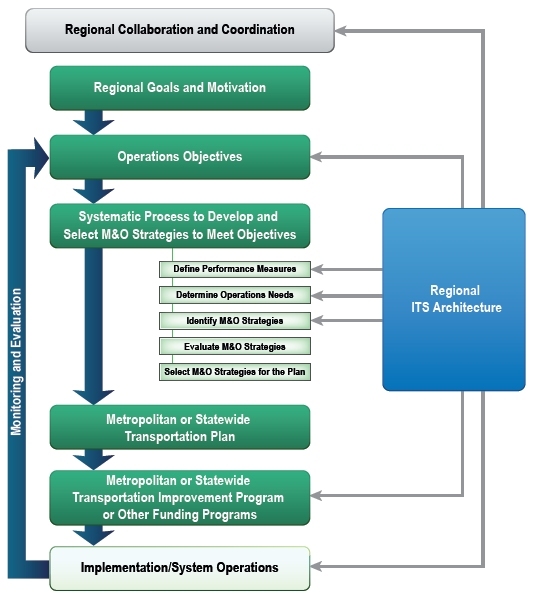 The regional ITS architecture can provide support in almost all areas of the objectives-driven, performance-based approach to planning for operations as shown in Figure 1. The Federal Highway Administration (FHWA) and the Federal Transit Administration (FTA) recommend the use of an objectives-driven, performance-based approach as an effective way to integrate operations in the metropolitan and statewide transportation planning processes. The approach focuses on the use of specific, measurable, and outcome-oriented operations objectives to guide the planning and programming of M&O. Sustain and build on the collaborative relationships from the regional ITS architecture development. Consult the architecture to identify available sources of operations data to track measurable objectives. Gather information on operations needs from the architecture and ITS stakeholders. Examine service packages in architecture when identifying ITS-based M&O strategies. Include the architecture as part of the transportation improvement program (TIP) development process. Use the architecture's operational concepts, functional requirements, and other contents to kick-start project development. In order to realize these opportunities and achieve the greatest benefit, the regional ITS architecture may require an update so that it is current and supports the intended use. Updating the regional ITS architecture to support planning for operations enables planners and operators to more easily access the relevant portions of the architecture and take advantage of the opportunities identified in this primer. Explicitly documenting the connections between the planning for operations and the regional ITS architecture will help link the efforts. Additionally, the development of an operations or ITS plan may be an effective way to bridge the gap between the metropolitan or statewide plans and the regional ITS architecture. An operations or ITS plan provides a collaborative strategy for implementing operations and ITS projects and programs over time and operating and maintaining an integrated transportation system. While there are a number of actions that a region can take to use the regional ITS architecture to support planning for operations, it is important to focus first on creating an architecture that is ready for use and taking steps toward those opportunities that will bring the greatest benefit to the region's planning for operations effort. Using the regional ITS architecture will result in more efficient, effective, and collaborative implementation of ITS-based operations strategies to improve transportation system performance.